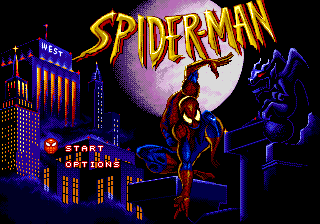 Though the Sega Mega Drive version of Spider-Man vs. The Kingpin was called just Spider-Man, Acclaim released its own game called Spider-Man for the Sega Mega Drive in 1995. This game is based on the animated series that aired around this time. A somewhat different SNES version was also released. Special red plastic versions of the cartridges also exist in North America. The game is a simple platformer. punches. jumps; Spider-Man can walk on ceilings by jumping on them. shoots a bullet of web. + shoots a string of web up to latch onto ceilings. Main article: Spider-Man (Acclaim)/Magazine articles.